You provide the film, we provide everything else! This Bronze Package brings together the essential elements for the ultimate in Movie Nights right in your own backyard. All you have to do is provide the film on an HDMI enabled device (most computers will do!). 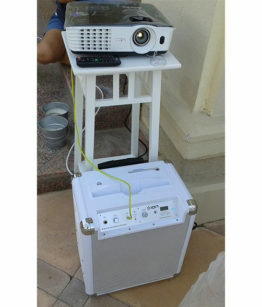 You provide your laptop or other media device as the source for the film. Please check with us as we have some adapters for Apple devices including iPads and MacBooks. This Silver Package brings together the essential elements and Snacks for the ultimate in Movie Nights right in your own backyard. All you have to do is provide the film on an HDMI enabled device (most computers will do!). This Gold Package brings together the essential elements and Snacks for the ultimate in Movie Nights right in your own backyard. All you have to do is provide the film on an HDMI enabled device (most computers will do!). New York style Hot Dog Cart Kiosk – 20 portions of Hot Dogs in a fresh bun served in an American style food tray with Condiments, and a packet of Crisps. Extra portions AED 15 each (must be ordered in advance). 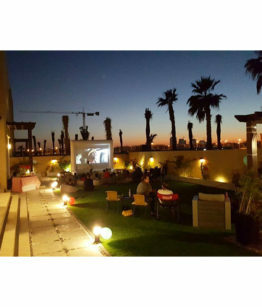 This Silver Package brings together the essential elements and Food / Snacks for the ultimate in Movie Nights right in your own backyard. All you have to do is provide the film on an HDMI enabled device (most computers will do!). This Platinum Package brings together our most fabulous offerings for the ultimate in Movie Nights right in your own backyard. All you have to do is provide the film on an HDMI enabled device (most computers will do!). Hot Dog Kiosk – 20 servings – Each serving includes Hot Dog in a Fresh Bun served in an American style Food Tray, with condiments and a packet of Crisps. Extra servings AED 15 each. 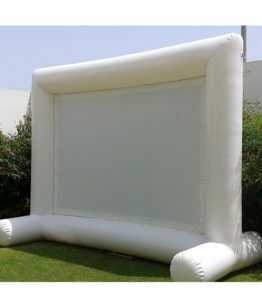 Bring the big screen home to your very own garden! 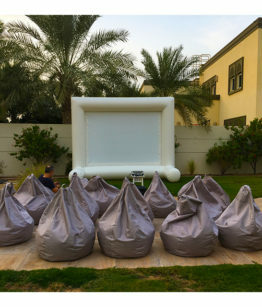 You can rent our Outdoor Cinema Package, complete with large inflatable Cinema Screen, Projector, Projector Stand, Speaker and all cables, and have a movie night at home in the comfort and privacy of your own garden or courtyard. 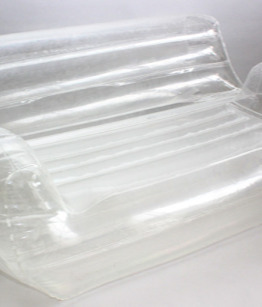 Complete the experience with our inflatable sofa selection (extra charge) – either our funky transparent double and single sofas for older children and adults, or for the little ones, super cool kids chesterfield sofas in red colour. For a more laid back or casual experience, we also offer beanbags (extra charge). Add in one of our Pop-up Snack food kiosks (Salted Popcorn, Caramel Popcorn and Candy Floss) and you’re almost done! The only thing left is to fire up your HDMI-enabled laptop or media device with your film of choice. Couldn’t be easier. Also a great way to watch the big game or other major sporting event on the big screen. Can also be used for avid gamers looking for an extra special gaming experience. NOTE: It has to be dark to watch the cinema, so please take note of sunset timings when planning your Cinema Night. Very important: Your movie should be FULLY DOWNLOADED onto an HDMI enabled device (laptop, media player, etc) to connect to our projector. It should not be streaming over WIFI. Price includes free delivery and setup to private residential locations only. Extra charges apply for late night pickups. 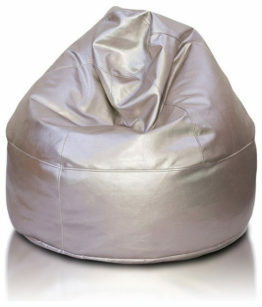 Suitable for children or adults our Silver Beanbags make the most stylish accessory for your outdoor cinema night or garden party. 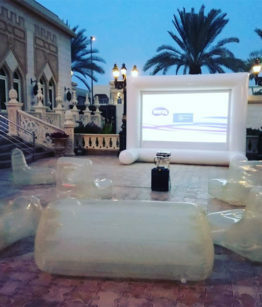 Our funky transparent sofas will add that special touch to your party or event. The double sofa offers comfort, simplicity and high design, and can be used in many diverse contexts and environments, including parties, movie nights, events, tradeshows, offices, etc. Mix the double sofas with the transparent single sofas for a complete look that will cater to all your guests. Hire charge includes set-up / inflation and pack-up / deflation. The single sofa offers comfort, simplicity and high design, and can be used in many diverse contexts and environments, including parties, movie nights, events, tradeshows, offices, etc. Mix the single sofas with the transparent double sofas for a complete look that will cater to all your guests. We are a boutique party hire service in Dubai catering to those who are seeking affordable options for throwing a great party. We work with families and party planners to provide quality products that are stylish and will add that special touch to your event.